Needless to say there’s been quite a bit of tree falling down in these parts recently, what with a hurricane and then an even worse storm a few weeks later. 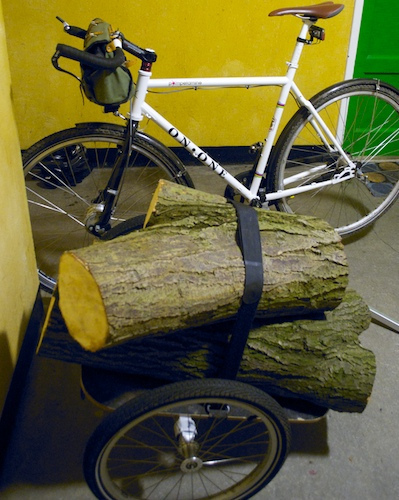 The trailer itself was quite happy with 73KG (I can see it coping OK with the rated 90KG max, or even more) but the supplied velcro strap wasn’t really sufficient to control logs of this size – they really need to be secured at two points to prevent the load shifting over our crazily potholed streets! Next up, a washing machine challenge across Edinburgh? 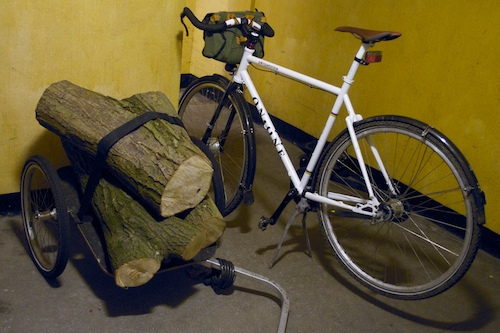 Ive had 147kg of logs on my y frame, mostly slightly down hill around 2km. Steady as s(he) goes. Dave McCraw » Who cares about the fuel strikes?